Driving traffic to your website is difficult. Driving quality traffic that brings prospects with a high potential to convert is even more difficult. As the inbound methodology of marketing continues to take off, the term buying personas has generally been accepted as the launching pad for driving quality traffic. For those that are unfamiliar with the term, buyer personas are fictional, generalized representations of your ideal customers. Personas help us to internalize the ideal customer we're trying to attract, and relate to our customers as real humans. From here businesses can focus on creating quality content aimed at the different personas for various stages in the buying process. Again, while this is a strong launching point, without promoting your content through the proper channels and using various other strategies to capture leads, your inbound marketing efforts won’t get you far off the ground. Without further ado, here are my 15 ways to drive high quality traffic to your website. Blogging is vital to driving quality traffic to a business’ web page. A blog is essentially a platform to provide helpful and meaningful information to prospects while establishing yourself as an expert in the field. Additionally, blogging is a great way to stay at the forefront of prospects minds while not in direct communication with them. If blogging is not currently a part of your business’ content strategy, you’re making a mistake. 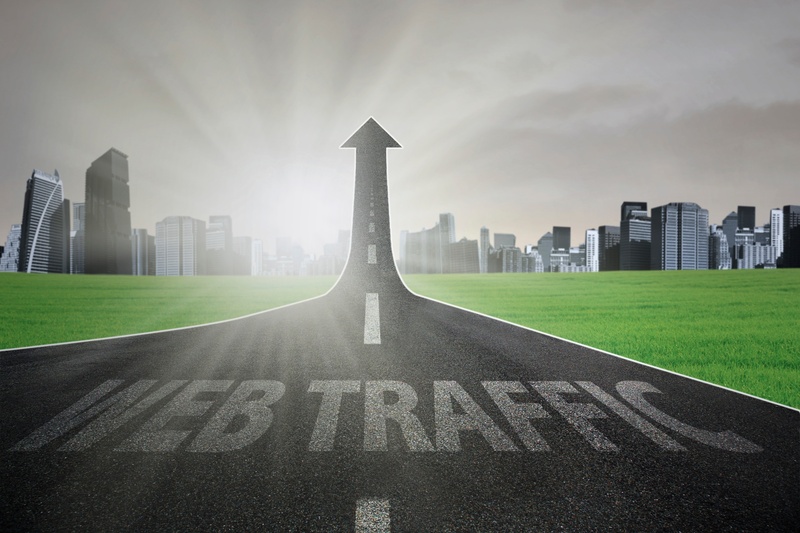 It is essential to bringing quality traffic back to your site. Get ready because many other aspects of blogging will appear throughout this list. Creating content is a necessity that takes a lot of time and effort, but if that content isn’t being seen by your buyer personas then your time and effort is wasted. Having the right distribution channels is essential and none are more important than social media. As you create new content on your site and share it across your various social media channels you will have the opportunity to connect and engage with prospects. I was told a long time ago that businesses should think of their website as a mansion in the woods. You have this beautiful home that you’d like to share with friends and guests, but no one can get there if there aren’t any roads to take you to the house. Internal links are the roads that bring prospects back to your digital mansion. Including internal links on site pages, blog posts and other content pieces will ensure all the high quality traffic looking for your business doesn’t get lost in the woods. The best thing about blogs (yours and others) and social media is that they provide a direct line to people with an interest in your business and your industry as a whole. To take full advantage of these channels, make sure that your voice is heard. By commenting on blogs and sharing your professional insight in social media groups, you establish yourself as an expert and a leader in the industry. A recent study by brafton.com determined that 94 percent of B2B buyers research online before making a purchase. Without a strong keyword strategy, your organic SEO will struggle and little traffic will find you via various different search engines. The Google Adwords Keyword Planner is a great tool to determine what terms are applicable to your website/ organization. Finding out which keywords and terms connect with your buyer personas will go a long way in driving quality traffic to your site. I’ve talked a lot about blogging so far as a primary tool to drive quality traffic and I am not done yet. In addition to developing your business’ blog as a resource, guest posting on a popular industry blogs provides an invaluable opportunity to present your ideas and expertise to a brand new audience. Don’t get me wrong, prospects love hearing from you. But more than hearing from you, they want to hear from someone else who can vouch for your business. Customer case studies or success stories will bring in quality traffic from prospects that are in decision mode, while painting a picture of how your business model could work for them. Inbound marketers know all too well that just because a prospect fills out a form to receive some type of premium content does not mean they are ready to buy. In addition to making it very easy, adding a blog subscription check box to forms gives prospects an easy opportunity to engage when they are ready. This means more blog subscribers and ultimately leads to more quality visitors to your website. If you are a small to midsize B2B business you may think connecting with an industry influencer for an interview is a long shot, but you never know until you try. Typically influencers are more than willing to share their experiences in a mutually beneficial interview. You are promoting the ideas and expertise of the influencer while boosting your credibility by association. The interview can be posted on your website, used to develop a whitepaper, or repurposed in a variety of other manners. This will serve to drive quality traffic back to your site. And if you’re lucky the influencer will share the interview with his friends, fans, and followers which further builds your brand and provides new opportunities. Another great way to build your network and drive quality traffic is by mentioning influencers in tweets. The concept is simple. Mention your influencer in a tweet and they retweet your post. Your tweet is now being promoted to all of that influencer’s followers so sit back and watch your followers increase and traffic flow in as a result. Although Pay Per Click advertising can be expensive, it has undeniable benefits. While driving traffic organically can be very time-consuming, PPC has more of an immediate effect. It also allows for extremely targeted campaigns based on time and place which can lead to high quality traffic. We have already reviewed multiple avenues to drive referral traffic such as social media and guest blogging. In fact, by definition referral traffic is driven by either inbound links or social activity. Referral traffic is valuable because it sends prospects to your website from new domains which provides additional SEO benefits. Given that your email list is comprised of contacts that are already familiar with your business and the services you provide, promoting your blog to them seems obvious. You never know when a blog update may reignite the interest of a long lost prospect who stalled out somewhere along their buyer’s journey. My final way to drive quality traffic once again reverts back to blogging. The more data you use in your posts the better. There is a saying we have here at Imagine, “In God we trust, everyone else better have data to back it up.” Prospects often have the same mentality. They want the information you provide to be backed up with data. There you have it; my 15 ways to drive quality traffic back to your website. Take advantage of these tips while gearing content toward your buyer personas and not only will volume of traffic increase but the quality of that traffic will increase as well.